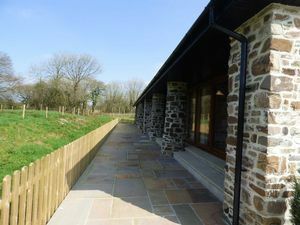 Enjoying an ENVIABLE PEACEFUL SETTING at Blagdonmoor Wharf, this NEWLY CONVERTED, HISTORIC STONE and SLATE barn can be found DOWN A PRIVATE LANE, within a relatively UNKNOWN SPOT, consisting of only 5 other properties. 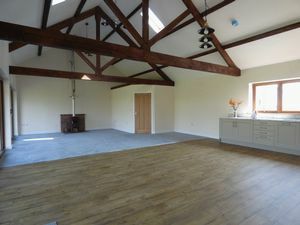 The property has been sympathetically restored and offers a wealth of charm and character throughout, as well as under floor heating to the ground floor. There are exposed timbers and large patio doors run along the whole of one side, taking full advantage of the outlook through the four stone built columns and across the stream to the paddock. 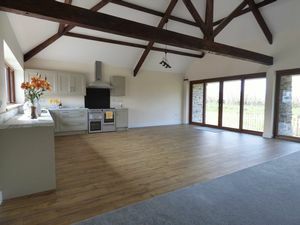 The accommodation in brief compromises an entrance hallway, just under 37 ft long open plan kitchen/ dining/ living room, inner hallway, utility room, three double bedrooms and a family bathroom on the ground floor. On the first floor the landing gives access to the master bedroom with en suite shower room. 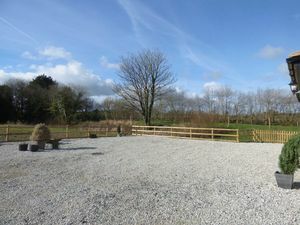 Outside there is plenty of off road parking, a large garden ready for landscaping, small stream/ former canal and paddock. An opportunity to enjoy a peaceful, rural setting, yet being only two miles away from the sought after market town of Holsworthy and local amenities it has to offer. 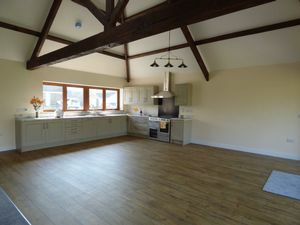 The property lies on the edge of a small rural hamlet set down a private lane just under two miles from the market town of Holsworthy which offers a variety of attractive shops set around the town square, doctors, dentists and veterinary surgeries, places of worship and Waitrose supermarket. 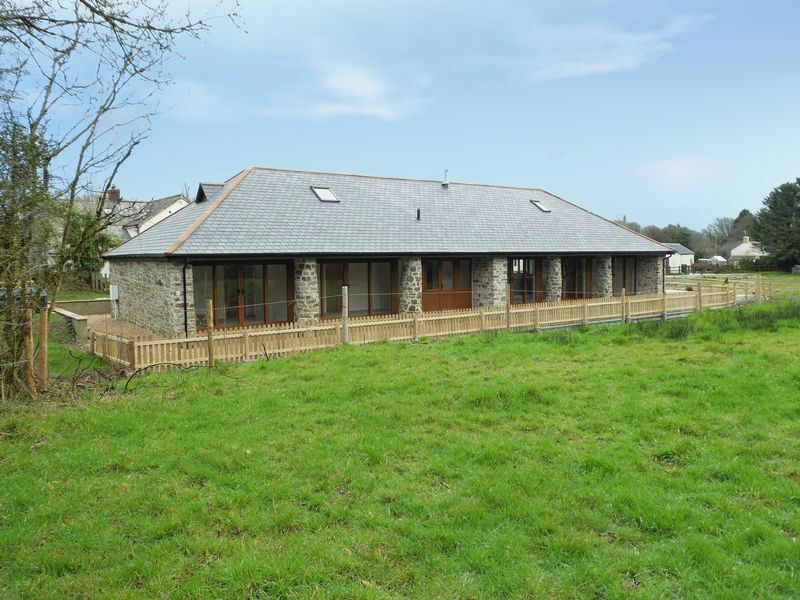 The coastal resort of Bude is some 10 miles to the west, with its sandy beaches, cliff walks and access to the A39 Atlantic Highway. 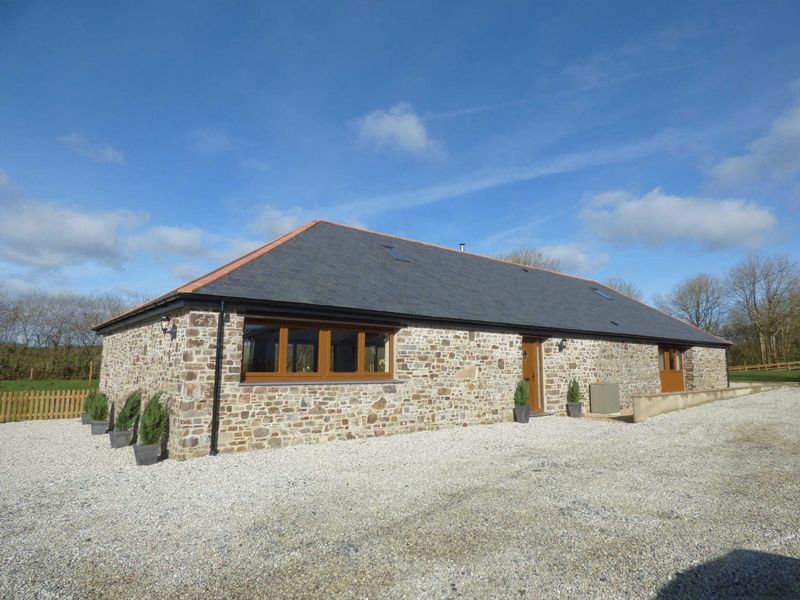 The hamlet is reached by a minor country road accessed off the main A388 road which links Holsworthy to the town of Torrington and therefore offers good road access for those wishing to explore this area of the Westcountry. To the east is the A30 which links the cities of Truro and Exeter. At Exeter there is access to the M5 motorway network, mainline railway station serving London Paddington and international airport. 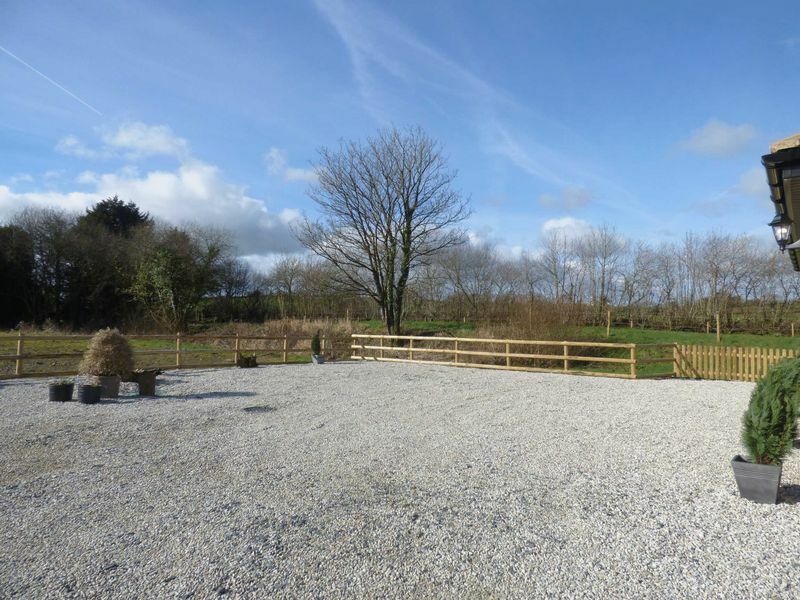 In all, the area is based broadly on agriculture and tourism, both of which provide excellent opportunities for the facilities that are offered at the property. After many years of planning and feasibility studies in 1819, the Bude Harbour & Canal Company was formed. Work commenced in July of that year, and 35.5 miles of canal were eventually completed in 1825. The main line ran from Bude to Blagdonmoor Wharf with a branch from Red Post to Druxton Wharf near Launceston, along with a "feeder arm" from Lower Tamar Lake which supplied the canal with water. Interestingly, its construction and operation was solely for the transporting of lime rich sand to improve the soil of the local farms. As may be anticipated with the event of the railway network and new chemical fertilisers, the canal fell into gradual decline. 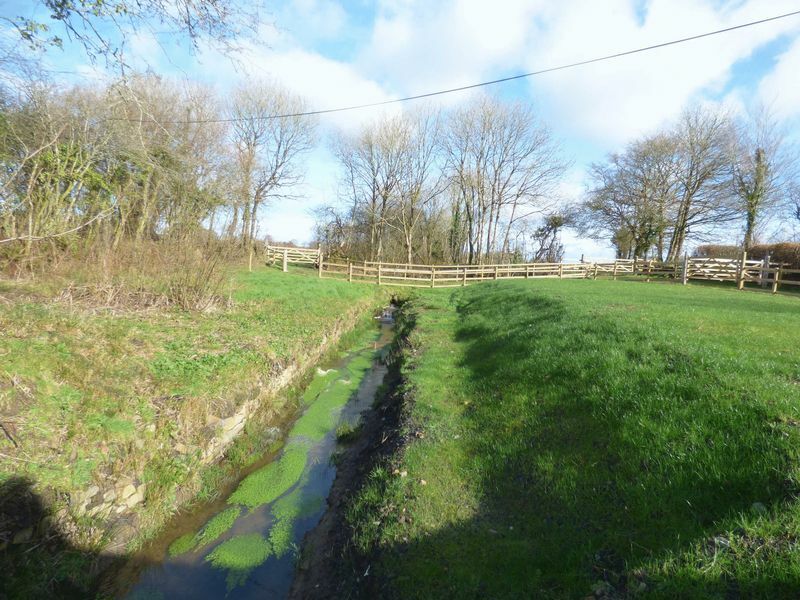 Today, intriguing remnants of the canal can be found along the old routes, and the barn at Blagdonmoor Wharf is a great example of one of the former canal buildings and its infrastructure. Double glazed front door with diamond window pane and window to side. underfloor heating. Thermostat. Smoke alarm. 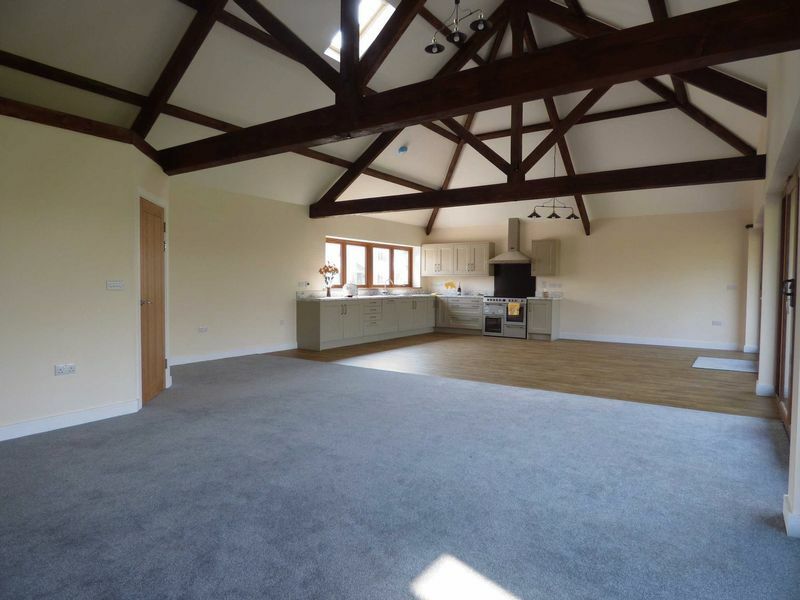 A truly impressive spacious open plan room with maximum 17ft 8" ceiling height. 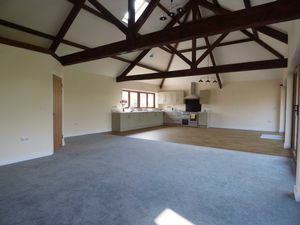 Open vaulted ceiling with exposed timber roof A frames. This light and airy room is dual aspect, with a wide window in the kitchen area to the front and full width glazing to the rear, with sliding patio door opening out to the garden terrace and stream beyond, with view across to the paddock. The distinctive stone columns make an attractive feature. 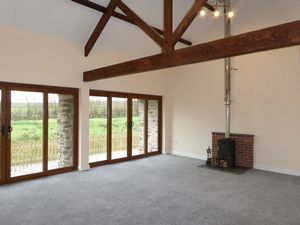 To the living area there is a wood burning stove on a slate hearth with brick fireplace. Underfloor heating. Thermostat. Smoke alarm. Newly fitted with floor and wall mounted English kitchen units with inset one and a half bowl sink, with marble effect work surfaces. Built in dishwasher, ‘Leisure’ electric twin oven range cooker with five halogen hobs and warmer, with extractor hood over. Staircase to first floor with under stair cupboard housing underfloor heating controls. Smoke alarm. Inset lighting. Doors off to the bedroom corridor and utility room. 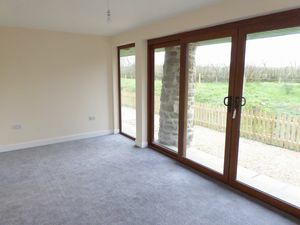 An L shaped room with double glazed back door leading out to the garden with window to side. Fitted kitchen unit with one and a half bowl stainless steel kitchen sink with cupboards and under worktops space for washing machine and tumble dryer. Electric consumer unit. Extractor fan. 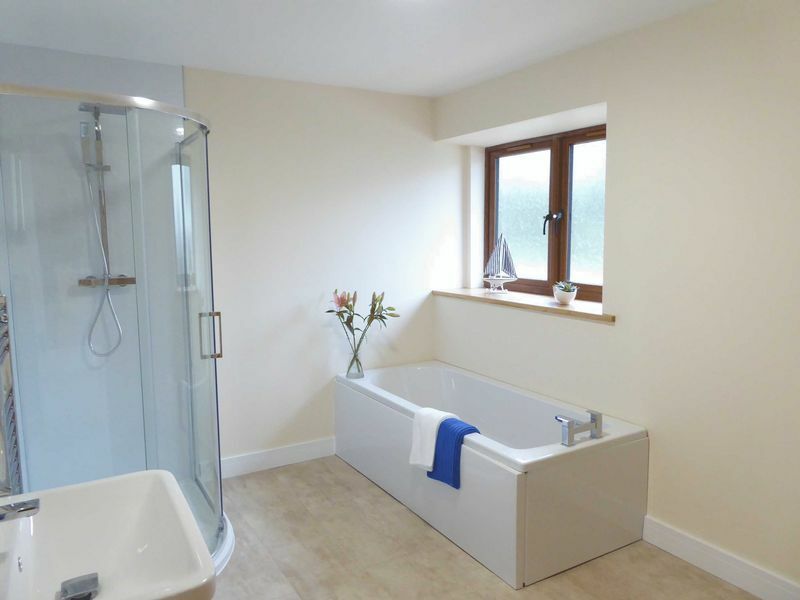 Walk-in cupboard with pressurised hot water tank with immersion heater. Frosted double glazed window to front. Underfloor heating. Electric towel radiator. 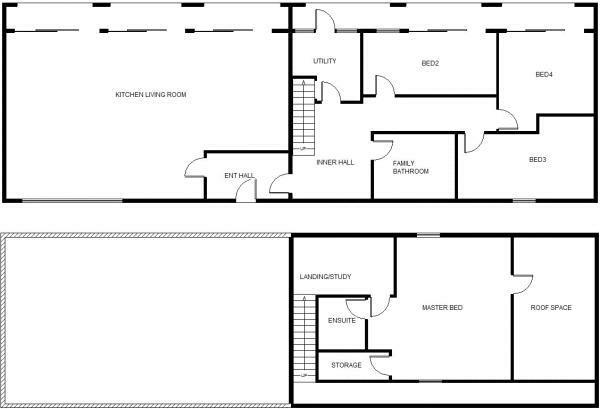 White suite of panelled bat and shower cubicle with twin head mains shower. Hand basin in vanity unit. WC. Extractor fan. Doors off to three bedrooms with inset lights and smoke alarm. Fully glazed the full length of the room with sliding patio door opening out to the garden. TV point. Thermostat. Plus lobby. 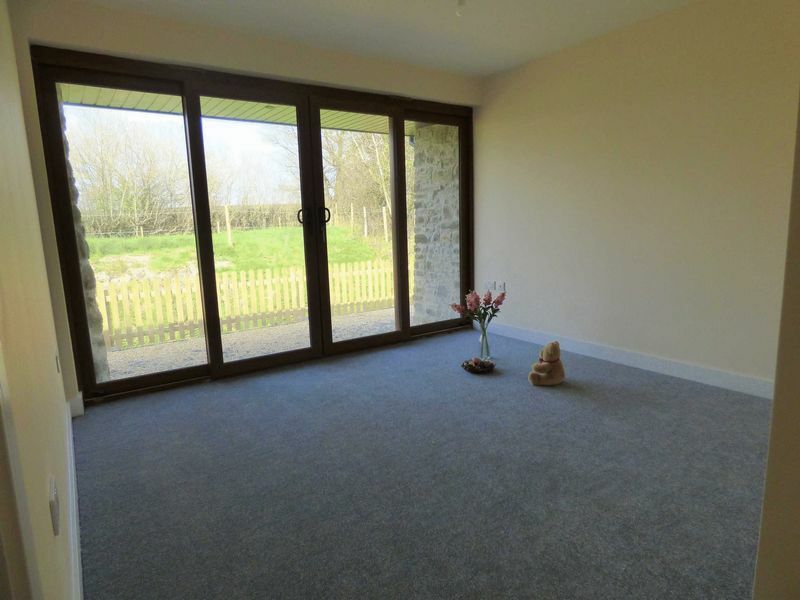 Full width glazed windows to rear overlooking the gardens, stream and paddock with sliding patio doors. Thermostat. TV point. Double glazed window to front. Thermostat. TV point. 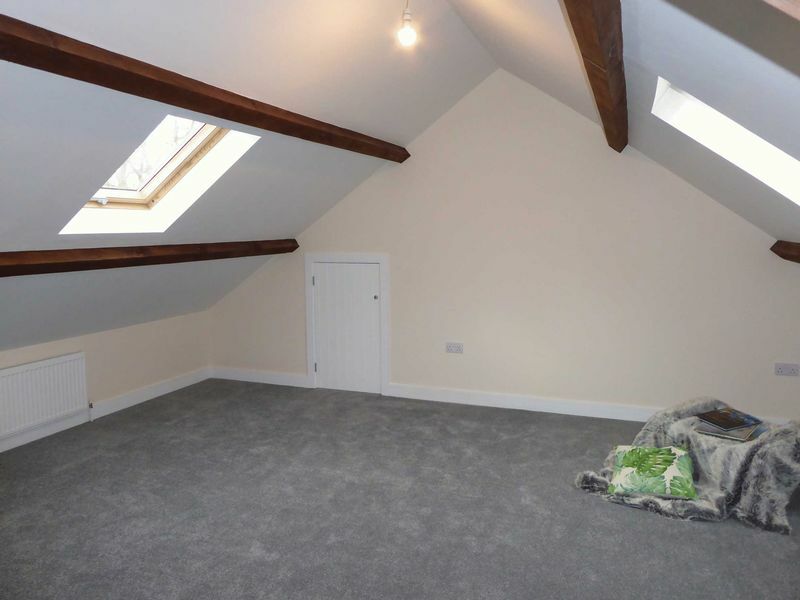 Sloped ceiling, exposed roof purlins. Smoke alarm. At floor level. Sloped ceiling. Exposed roof timbers. Dual aspect velux windows to front and rear. Two radiators. Thermostat. Under Eaves storage cupboard. Access to loft storage. Access to barn owl box. Light and TV aerial. 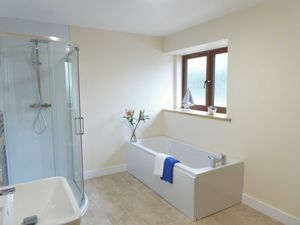 Shower cubicle with twin head mains shower. WC. Hand basin in vanity unit. Extractor fan. Towel radiator. To the western side of the property there is an extensive gravelled area, providing off road parking for several vehicles, with a path running along the front of the barn. Situated on the former canal, there is a small stream providing wildlife interest set down to the rear of the barn with its most impressive original stone columns. There is a delightful paved patio that sliding doors from the open plan kitchen/ dining/ living room and two bedrooms open onto, with non slip steps and down lighters above. 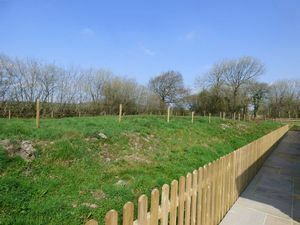 To the side of the property is a large area of lawn, ready for landscaping and giving any prospective purchaser the opportunity to really make the garden their own. 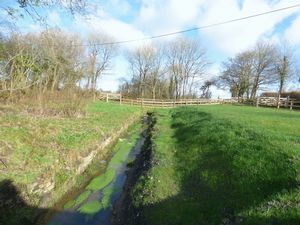 Across the stream is a small paddock accessed by a right of way. In all the grounds extend to about 0.7 of an acre. 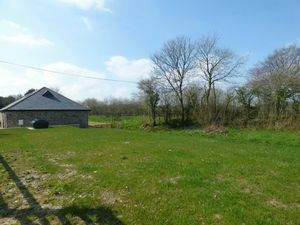 This extends to about 3.7 acres and includes two long paddocks and the tree lined stream in the former canal and lies just beyond the barn. 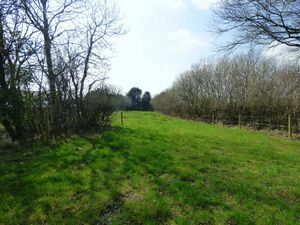 It is mainly level with well maintained hedges that have been cleared and stocked fenced with new posts, and 2 strands of wire. This is complemented by new gates throughout. Perfect for stock or equestrian use. 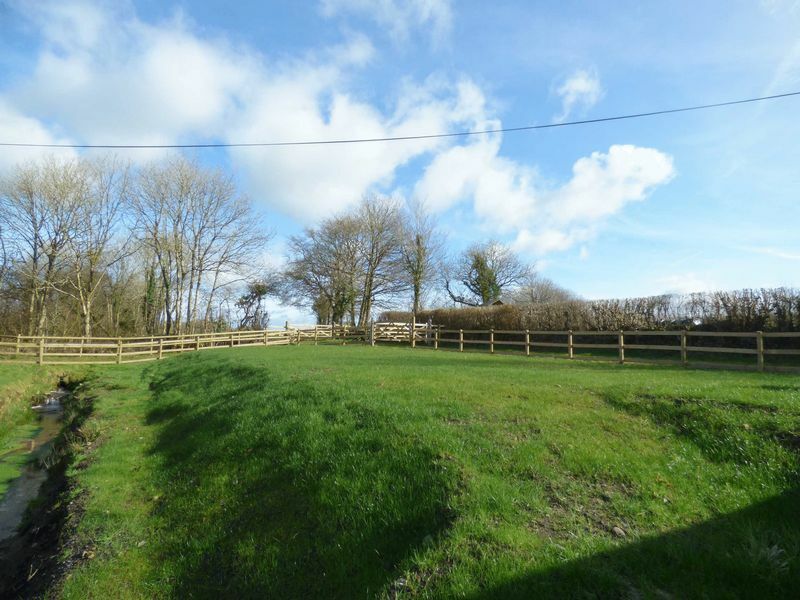 The property is reached by a right of way along a shared track of about 280 metres serving the small hamlet, which leads past the other houses to the barn at the end and access to extensive gravelled parking area. Mains metered water and electricity. Private drainage by way of a new 'Klargester' treatment plant. Oil central heating.